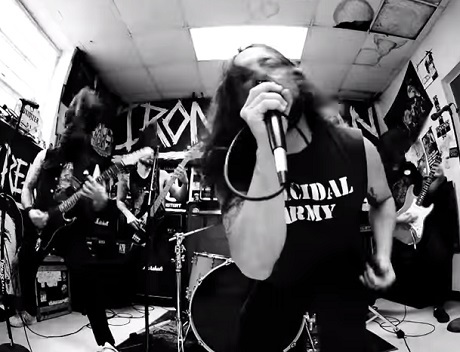 Iron Reagan are doing what they do best in the new video for The Tyranny of Will number "I Won't Go": delivering a distorted, disemboweling thrash attack. Despite the destructive force of the quintet, you can argue that the practice space setting makes for a much more intimate look at the band. As you'll see down below, the video is presented in black and white and features a few claustrophobic angles captured by cameras crammed into the rehearsal room. Maniacal metronome thrash beats, detuned guitar chugging and angered cries are the name of the game, with Iron Reagan offering plenty of such as they jump around and whip their mighty manes. Don't forget: in addition to the newly launched video, you can catch the band in the flesh alongside Napalm Death and Voivod in the new year. You'll find all the details of the upcoming "Through Space and Grind" tour, including info on Canadian dates between Vancouver and Montreal, over here.